This is a list of domesticated animal breeds originating from Scotland. To be considered domesticated, a population of animals must have their behaviour, life cycle, or physiology systemically altered as a result of being under human control for many generations. Scotland has produced some of the longest established breeds of domesticated animals still in existence. There are 37 individual breeds of animals from Scotland still in existence and three extinct breeds. The Soay Sheep has prehistoric origins, and the Galloway breed of beef cattle dates back several hundred years. 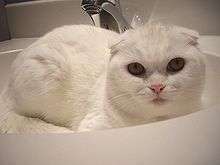 New breeds have also been developed more recently in Scotland, such as the Scottish Fold cat, which dates from 1961. 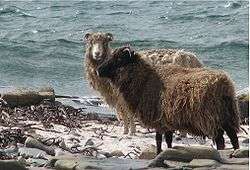 The North Ronaldsay Sheep is a most unusual breed, subsisting largely on a diet of seaweed, and the Boreray is the UK's rarest sheep, having been listed as "Category 2: Endangered" by the Rare Breeds Survival Trust. 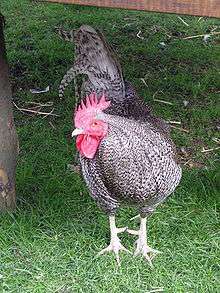 Some breeds, such as the Shetland Pony and the Border Collie are well known throughout much of the Western world, whilst others such as the Scots Dumpy chicken are little-known, even at home. 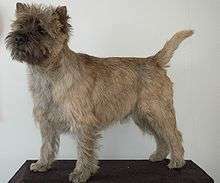 Nine breeds of dog have Scottish origins, including five terrier breeds. Indeed the relative isolation of many of Scotland's numerous islands has led to a preponderance of breeds from these places being represented. Various breeds are now extinct, including the Grice, an archaic and somewhat aggressive pig. 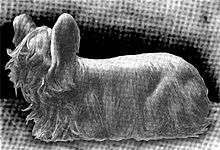 Cattle Post 1947 Luing "Firmly established"
Prior to their demise, the Paisley Terrier contributed to the bloodline of the Yorkshire Terrier and the Scottish Tan Face to the Boreray sheep. Although Galloway Ponies were praised by Gervaise Markham in the 17th century for their "fine shape, easie pace, pure metall and infinit toughness", true to form Samuel Johnson described them as "common hackneys". It shares its origins with the still extant Fell Pony. A model of the Grice, whose habit of attacking lambs cannot have aided its survival, was recreated by a taxidermist in 2006. ↑ Hirst, K. Kris "Top 5 Signs of Domestication" About.com Retrieved 20 July 2009. 1 2 "Scottish Fold Cat Information". Pet Finder. Retrieved 14 November 2015. 1 2 "North Ronaldsay". Sheep Breeds. Seven Sisters Sheep Centre. Retrieved 23 April 2009. 1 2 "RBST Watchlist". Retrieved 8 November 2015. ↑ "Dogs from Scotland". InfoDogs. Retrieved 14 November 2015. 1 2 3 "Extinct Island Pig Spotted Again". BBC News. 17 November 2006. Retrieved 1 January 2007. ↑ "Angus" Oklahoma State University. Retrieved 21 July 2009. 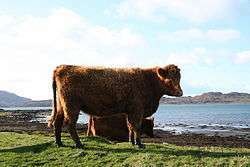 ↑ "The Breed" Ayrshire Cattle Society. Retrieved 20 July 2009. ↑ "Why Ayrshires" US Ayrshire Breeders' Association. Retrieved 20 July 2009. 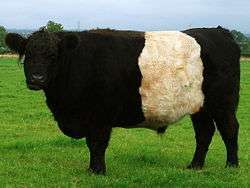 ↑ "Belted Galloway" Oklahoma State University. Retrieved 20 July 2009. 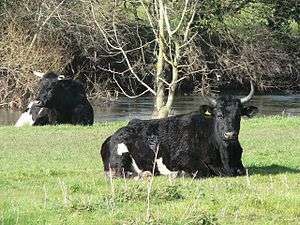 ↑ "Galloway History" Galloway Cattle Society of New Zealand. Retrieved 20 July 2009. ↑ "The Highland Breed" Highland Cattle Society. Retrieved 20 July 2009. 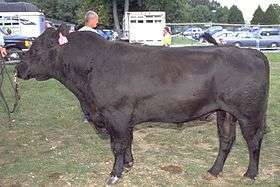 ↑ "History of the Breed" Luing Cattle Society. Retrieved 20 July 2009. 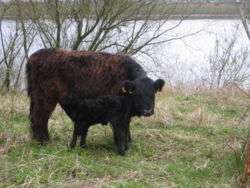 ↑ "Home" Shetland Cattle Breeders Association. Retrieved 20 July 2009. ↑ "Scots Dumpy" feathersite.com. Retrieved 20 July 2009. ↑ "Scots Dumpy chickens at Kintaline Farm" scotsdumpy.co.uk. Retrieved 20 July 2009. ↑ "Scots Grays" feathersite.com. Retrieved 20 July 2009. ↑ " Scots Grey Hens at Kintaline Farm" scotsgrey.co.uk Retrieved 20 July 2009. ↑ "About the Breed" The Friendly Beardie Club. Retrieved 21 July 2009. 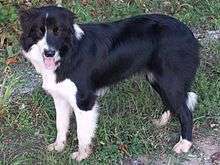 ↑ "Collie breed history barkbytes.com. Retrieved 21 July 2009. 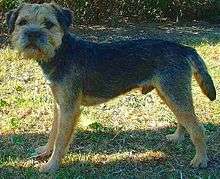 ↑ "History of the Border Terrier" Oberlin University. Retrieved 21 July 2009. 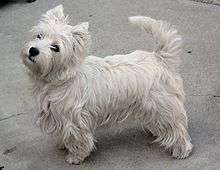 1 2 3 4 5 Initial grouping of several of the highland terriers (including the Scottie) under the generic name Skye terriers has caused some confusion in the breed’s lineage. There is much disagreement over whether the Skye terriers mentioned in early 16th century records actually descended from forerunners of the Scottie or vice versa. See Choosing a Scottish Terrier" Petplace.com. Retrieved 20 July 2009. 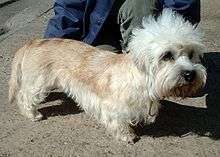 ↑ "Dandie Dinmont Terrier History". Caledonian Dandie Dinmont Terrier Club. Archived from the original on 10 September 2009. Retrieved 21 July 2009. 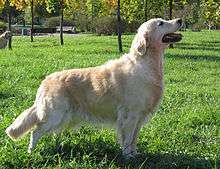 ↑ "Golden Retrievers: History" K9web.com. Retrieved on 30 November 2007. ↑ "About Gordon Setters" Gordon Setter Cub of America. Retrieved 20 July 2009. 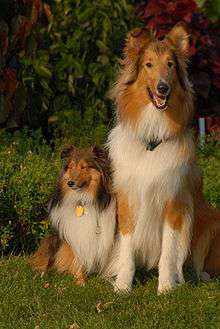 ↑ "History of the Rough Collie" collienet.com. Retrieved 21 July 2009. 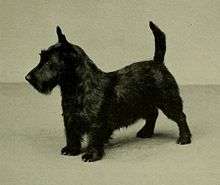 ↑ "Scottish Terrier" Britanica. Retrieved 20 July 2009. ↑ "Endemic Vertebrates of Shetland" nature-shetland.co.uk. Retrieved 20 July 2009. This source suggests that this is "a debatable breed, the Kennel Club variety probably differing significantly from the dogs that were used in Shetland in the past". ↑ Threlfall, Sine "Breed History" Skye Terrier Club Retrieved 20 July 2009. ↑ Savill, Richard (5 July 2006) "Skye Seven raise hope for breed's survival" The Telegraph. Retrieved 20 July 2009. ↑ "Shetland Geese". feathersite.com. Retrieved 22 October 2008. ↑ "Shetland Goose" American Livestock Breeds Conservancy. Retrieved 20 July 2009. ↑ "Breed History" Clydesdale Horse Society. Retrieved 20 July 2009. ↑ "Eriskay Pony". Breeds of Livestock. Oklahoma State University. Retrieved 19 March 2009. 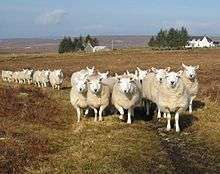 ↑ "Watchlist: Eriskay" Rare Breeds Survival Trust. Retrieved 20 July 2009. ↑ "History of Highland Ponies" Strathspey Highland Ponies/freespace.virgin.net. Retrieved 20 July 2009. ↑ "Highland Pony" mahalo.com. Retrieved 20 July 2009. ↑ Both sources state that fossil remains of the ancestors of the modern breed have been found dating from "60,000 BC" prior to the last Ice Age. 1 2 "Breed History" Shetland Pony Studbook Society. Retrieved 20 July 2009. ↑ According to equine-world.co.uk "The first written record of the Shetland pony was in 1603 in the Court Books of Shetland." ↑ "Shetland Pony" Equine World. Retrieved 20 July 2009. ↑ "Watchlist: Boreray" Rare Breeds Survival Trust. Retrieved 20 July 2009. This categorisation indicates that fewer than 300 individuals are known to exist. ↑ "Castlemilk Moorit". Breeds of Livestock. Oklahoma State University Dept. of Animal Science. Retrieved 27 January 2008. ↑ "Castlemilk Description". Castlemilk Moorit Sheep Society. Retrieved 7 April 2009. ↑ "Cheviot". Breeds of Livestock. Oklahoma State University, Dept. of Animals Science. Retrieved 15 April 2009. ↑ "History of the Breed". Hebridean Sheep Society. Retrieved 20 July 2009. 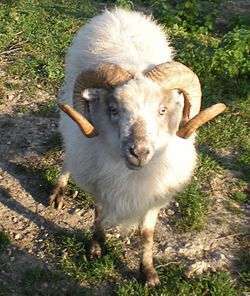 The breed is sometimes referred to as "St. Kilda Sheep", although it has no specific connection with the archipelago. ↑ "North Country Cheviot". Breeds of Livestock. Oklahoma State University, Dept. of Animal Science. Retrieved 6 April 2009. ↑ "A historic Introduction". The Native Sheep of North Ronaldsay. Sheep-Isle. Retrieved 23 April 2009. 1 2 "Scottish Blackface" sheep101.info/breedsS. Retrieved 20 July 2009. ↑ According to sheep101.info/breedsS "there is a tradition that they came from a Spanish ship wrecked during the northward flight of [the] Armada in 1588." ↑ "Shetland". 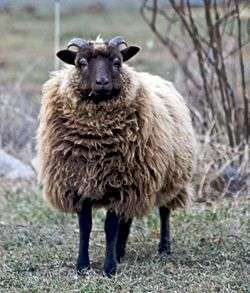 Sheep Breeds - S-St. Sheep101.info. Retrieved 1 May 2009. 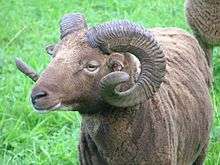 ↑ "A Thumbnail History Of The Soay Sheep Of St. Kilda" Southern Oregon Soay Sheep Farms. Retrieved 20 July 2009. 1 2 "Galloways and Fell Galloways" The Fell Pony Museum. Retrieved 21 July 2009. ↑ Bailey, Susan (24 January 2008) "The Evolution Of The Yorkshire Terrier" articlealley.com. Retrieved 21 July 2009. This source suggest the Paisley and Clydesdale were two distinct breeds at one time. ↑ Culley, George (1807) Observations on Livestock London. Wilkie, Robinson et al. pp 146, 160–161. Retrieved 7 July 2010.